Former NBA journeyman forward Rasual Butler and his American Idol wife were killed when their speeding Range Rover flipped over and crashed in California on Wednesday. Butler, 38, who played 13 seasons in the NBA from 2002 to 2016, crashed his Range Rover near Studio City in Los Angeles around 2am local time, according to TMZ. The vehicle reportedly hit a parking meter before slamming into a wall and flipping over. 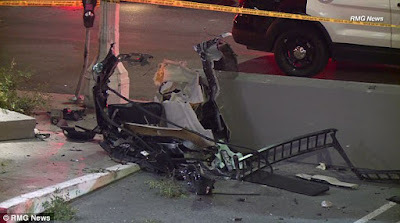 Police believe he was speeding at least twice the 35mph speed limit. LaBelle was also an Canadian-born American R&B singer. She signed a production deal in 2011 with LA Reid, Jermaine Dupri and Pharrell Williams and released a five-song sampler. Butler was not expected to have a lengthy NBA career when he was taken by the Miami Heat near the end of the 2002 draft but went on to play for eight other teams. But given his ability to play both small forward and shooting guard, coupled with his natural shooting ability, Butler carved out a role with several franchises, including the Heat, New Orleans Hornets, Chicago Bulls, Toronto Raptors, Indiana Pacers, Washington Wizards and San Antonio Spurs. He was named the NBA D-League's 'Impact Player of the Year' in 2013. May their souls rest in peace.